The town was settled in the late 1840s and a post office opened in 1855. The postmaster (named McRae) submitted the application under the name Fincastle - after the city in Scotland. The town was platted some seven years later. The first school was opened by the Tindels, a couple who had had the town platted. This simple log structure was followed by a larger building that served as a church and school. This building became a Union church with different denominations using the building on alternate Sundays and remained as a school until the Great Depression. It is still in use as a community center and for annual events. Fincastle played a small role in the Civil War. It was home to the first Confederate company raised in Henderson County and a quartermaster depot was built there. Fincastle had been the most prosperous town in Henderson County at that time. Fincastle's population was right around 100 people in 1884. Two years later it had increased to 150 and the town had a sawmill added to its businesses. When Fincastle was bypassed by the Texas and New Orleans Railroad around 1900-1901, and merchants and residents alike moved to nearby Poyner or Athens. The post office closed in 1907. At the time of the Great Depression, Fincastle had a school, church and store. Toward the end of the Great Depression, the population remained at 100 but declined to a mere 40 from 1949 through 1969. After 1969, population figures were not available. Fincastle Lake and Fincastle Nursery and Farms perpetuate the town's name. It remains a community, although there are no current population statistics available. One of the earliest settlements in Henderson County, Fincastle developed during the early 1850s. At that time, this part of the state was a center of economic activity with a growing number of plantations and farms. In 1851 John Tindel (1796-1864) purchased 1091 acres in the Juan Jose Martinez survey and later platted the community townsite. He laid out fourteen lots, measuring 60 feet long and 70 yards deep. 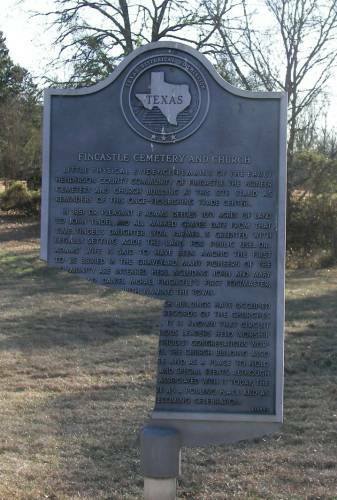 The community attracted farmers, tradesmen, professional people, and other settlers who came to Texas. Fincastle was the scene of much activity during the Civil War, as Capt. William H. ("Howdy") Martin came in 1861 to raise troops. In addition, a quartermaster and commissary department was established here. By 1880 Fincastle had several stores, a blacksmith shop, cotton gins, saloons, a combination drugstore and doctor's office, several churches, and a school. Farmers from surrounding areas came here to sell their cotton and produce and to buy supplies for their homes and farms. About 1900, most of the members of the settlement moved to the county seat of Athens, and Fincastle declined. A church, the Pioneer Cemetery, and the nearby home of John Tindel are all that remain of this early trade center. Little physical evidence remains of the early Henderson County community of Fincastle. The pioneer cemetery and church building at this site stand as reminders of this once-flourishing trade center. In 1851 Dr. Pleasant P. Adams deeded 1091 acres of land to John Tindel, and all marked graves date from that time. Tindel's daughter, Lydia Parmer, is credited with legally setting aside the land for public use. Dr. Adams' wife is said to have been among the first to be buried in the graveyard. Many pioneers of the community are interred here, including John and Mary Tindel and Daniel McRae, Fincastle's first postmaster, who is credited with naming the town. A number of different church buildings have occupied this site. Although early records of the churches have not been maintained, it is known that circuit preachers and local religious leaders held worship services here. Baptist and Methodist congregations worshiped on alternate Sundays. 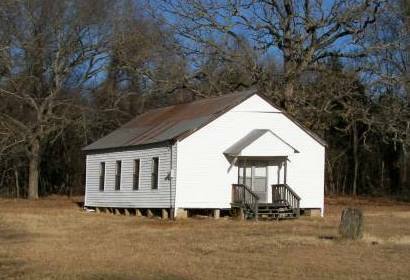 The church building also served as a schoolhouse and as a place to hold elections, political rallies and special events. Although no church congregation is associated with it today, the building continues to serve as a polling place and as the site of an annual homecoming celebration.